I had been wandering along the shore of this frozen loch looking for inspiration, when the appearance of weak Winter sun highlighted the differing textural patterns of the ice sheet. 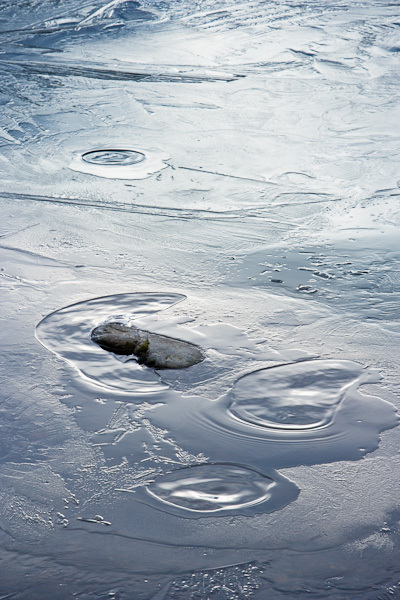 Although there was only one rock showing through the ice, there were a number of others hidden just under the surface. The flowing water below the ice produced just enough ripples to keep small pools of water ice free. The angular shapes of the ice contrasted markedly with the sinuous ripples of the water and the overflow's glassy mirrored surfaces. Photo © copyright by Graham Chalmers.